I'm lazy.....so I waited to combine my TUSAL and IHSW update together! What a wonderful weekend I had! 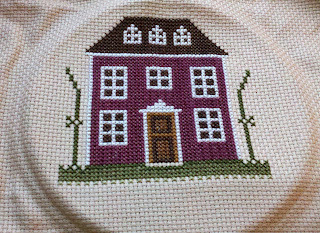 I spent most of Saturday with girlfriends...with the intent of working on my stitching, but of course I spent more time snacking on the yummy goodies everyone brought, watching movies and chit-chatting it up! 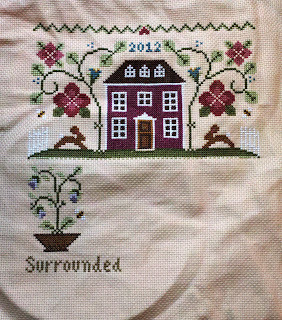 I did manage to get a few X's in......but the bulk of my weekend stitching was done on Sunday. I also did some shopping at some craft stores and I found an outrageous deal on these Thomas Kinkade Disney kits! I've seen these before, and they are usually around $40....but I think these 2 were mismarked at $8.99! Only the Tinkerbell and Pinocchio ones were at this price.....but I had some 50% off coupons....so I got them for $4.50 each! My niece is working on the Cinderella chart so I'll give these to her to add to her collection. I worked on 2 pieces for IHSW, my LHN piece Nature's Beauty and also a small HAED piece that I'm doing for someone special that is also in blog-world...so I won't post those updates until I'm done and have given it to her. This means I get to mark off task #6 from my rotation schedule!! I started into task #12 and just might finish it off today....to finish off the entire piece. What else did I do this weekend? Why.....I took part in the HAED half off coupon sale...of course!!! I know some of you out there did too!! If you did....what did you get? I just had to get Middle Earth...my husband glanced over my shoulder one day when I was reading through blogs and he saw the WIPs Ewa has...one of which is Middle Earth. He then shouted, "I want you to stitch that next!" He also threw in a, "I'll help you on it, I'll do some pages and you do the rest...it looks like there are only 5 or 6 shades of brown, right"? Right honey.....5 or 6 ......... I will probably never get to it, at least not anytime soon. But I bought it just in case it became retired. 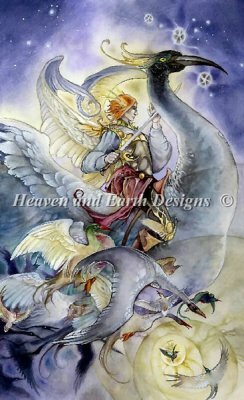 I also purchased 2 charts from SPML's tarot series. 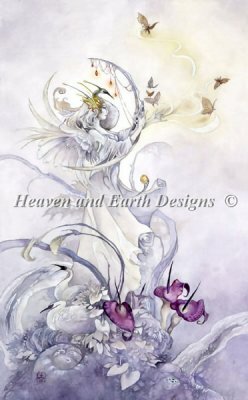 I've always wanted to finish a piece for mine and my husband's zodiac signs, but I haven't found one that I liked for both of us that were from the same artist. But...I ran across a tarot site that tells you your tarot card based on your date of birth, so I entered ours in and mine is the Queen of Swords and my hubby's is the Knight of Swords....and you know what...I LOVE both of these charts by SPML, so ka-ching....I bought them! I'm starting to get a non-cross stitchy itch....so I'm thinking after I finish Nature's Beauty I'll work on a quilt for my son, or some knitting/crocheting.... then come back to my cross stitch rotation plan. 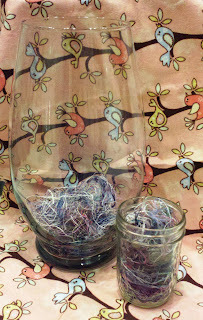 This doesn't help me get more of my HAED's done, but it will help me make a dent in my crafting stash! Sorry for such a long post.....hopefully I didn't put anyone to sleep for the start of the week!! Can't wait to play catch up today on everyone's blogs! You've done a lot on your ISHW, it's looking lovely. I like the Thomas Kinkade kits. I should imagine they will be much sought after before too long. Clicked on your link for my tarot card... I had great fun reading, and have bookmarked for later - thanks so much for sharing. Love the HAED's your purchased, haven't decided quite yet - time is running out, so must do quickly. Love your work. I'm loving the new charts, I'm still debating treating myself. I shouldn't, but that doesn't mean I wont. And your stitching looks great as well! THAT'S SO AWESOME! 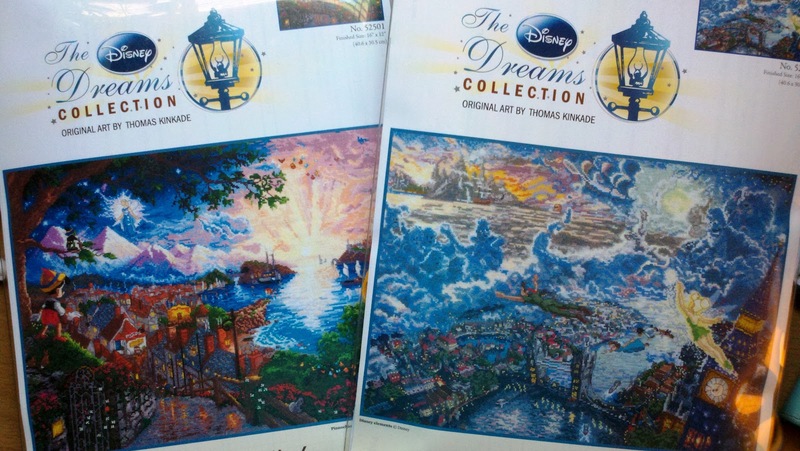 I love the Thomas Kinkade Disney charts - I've been lusting after them for a really long time - you always seem to find the best deals! You will probably finish Middle Earth before me. The things we do for our men! Love the tarot purchases! I'm the Page of Pentacles - also a beautiful chart. Maybe I'll get that one next! Wow what an update. Let's see if I can reply to everything haha. Love the fabric you found behind your TUSAL. Too cute. The Disney kits are very nice. Congrats on the deal. Wow what progress on your IHSW. I didn't allow myself to get any HAEDs this time. I want to finish the two I have going. 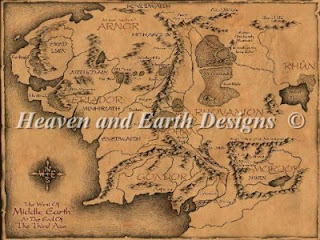 I do love the middle earth one. How many threads is really in it? The Tarot charts are very pretty too. Enjoy your non stitchy break and get back and go crazy with those beautiful projects. Nature's Beauty looks great Lesli. I have that one in my stash. Love the HAED's you chose. 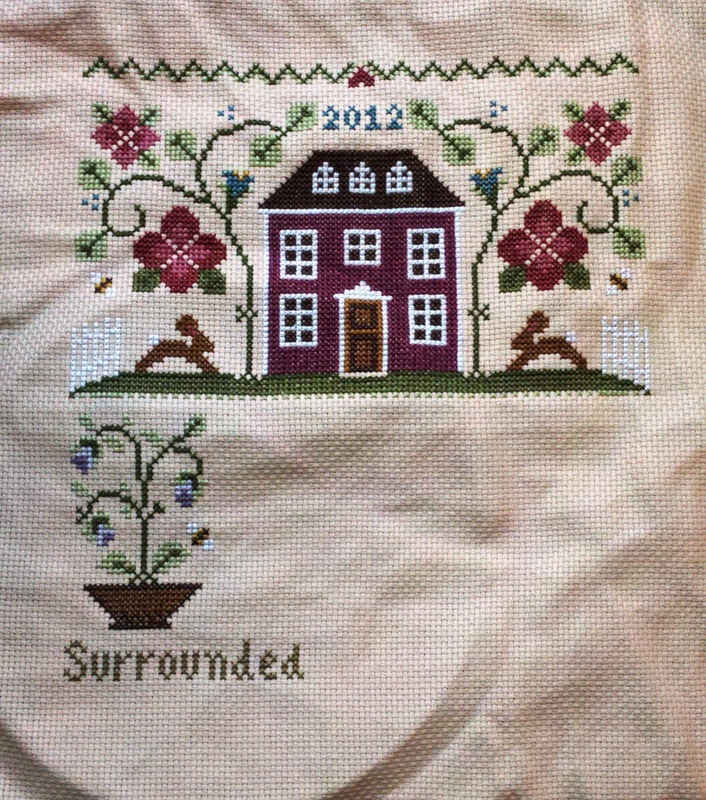 So wish I could stitch on higher count fabric. Oh well, I'll just watch everyone elses progress. Congrats on the awesome price for the Disney kits. I have 3 of them and would like to get the other four. Great progress for IHSW. Look forward to seeing your HAED when you are able, although I didn't think there was such a thing as a Small HAED LOL. Your orts looks great. Lovely new kits for your niece. Great new HAEDs. I only brought two - both Santas. Nice to see that you got load done for the hermit weekend. Love your excuses for buying more charts (in case it retires):)Which are nice by the way. *shakes self awake* "Are we there yet?" HAHAHAHAHAHHA!!!!! I'm kidding!!!! I enjoyed reading this post. :D Those Kinkade Disney kits... what a terrific steal, Lesli!!!! You got a LOT done on Nature's Beauty.... love the colors of the flowers in there. I snickered at your Tarot cards.... you tell him, sister friend!! Hehehehe. I really love the colours in Nature's Beauty. 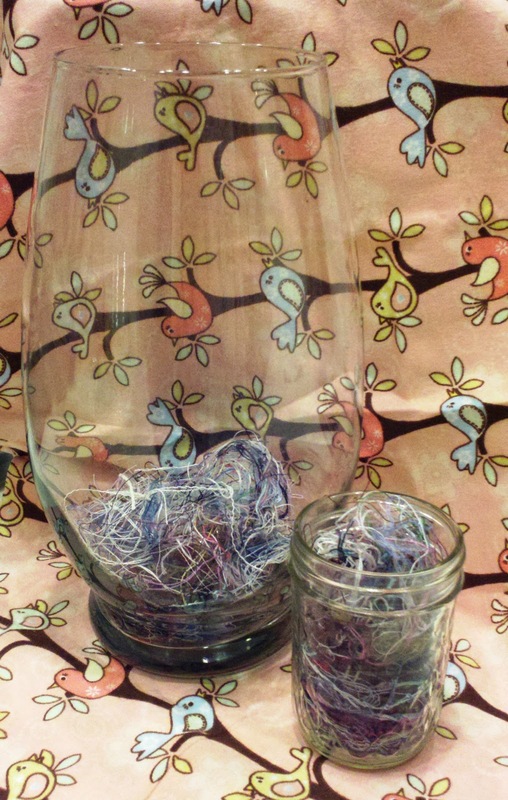 Love that fabric your TUSAL jar is sitting in front of!! Great progress on Nature's Beauty!! Loads of great charts too!!! Great stashing! Especially on those disney kits. I am so jealous! I would've snatched them up, too. 5-6 ... hmmm more like 70! There are a lot of browns! Also I love your cool deal on the disney charts!